Please consult our program and schedule for all the details! Here are just a few of the highlights from this year’s program. Emmy-winning journalist Elizabeth Fischer-Martin, from the School of Public Affairs at American University in Washington D.C., will analyze the changing role of mass media in an age of political polarization. 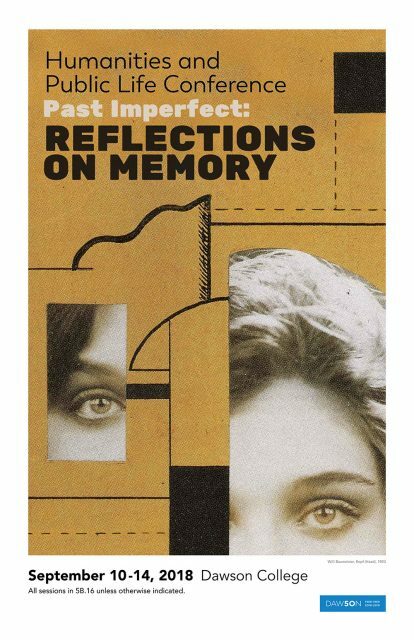 Philosopher and frequent Radio Canada guest, Michael Nafi, will explore neglected connections between the Greek and Islamic philosophical traditions on the nature of memory. Finally, our keynote, Catherine Richardson/Kinewesquao, a Metis counselor who teaches at the Université de Montréal School of Social Work, will discuss her extensive research on the role of dignity in responding to adversity and violence for human service workers. This is just a small sample of the many exciting talks at this year’s event! Talks are open to all students, faculty, and staff at Dawson College as well as to the general public. If you are a teacher and plan to bring a class, please let us know. Any inquiries can be directed to jnemeth@dawsoncollege.qc.ca.